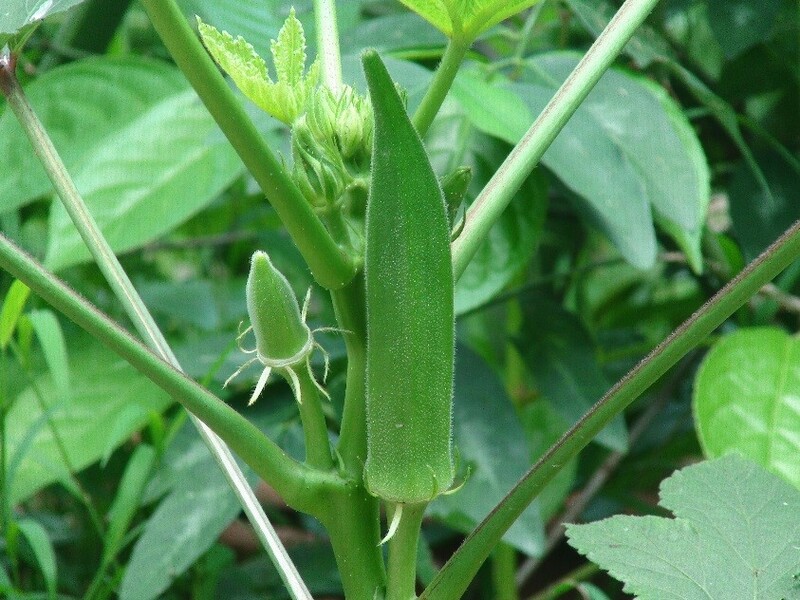 Image from: https://en.wikipedia.org/wiki/Okra Ah, okra. Okra is one of those divisive foods like mayonnaise or Brussel sprouts. Some people love it, while others are repulsed by the mere mentioning of its name. It’s like a culinary four-letter word. As a child, I was predisposed to hate okra. Everyone always described it as “slimy.” I’m not one for being a picky eater, but “slimy” isn’t typically a selling point for me when it comes to food. I refused to try okra for years because of this commonly used description. As an educator at HMNS, I frequently encounter children who are afraid of certain halls or objects, like the ferocious prehistoric beasts in our Hall of Paleontology or the mysterious mummies in the Hall of Ancient Egypt. When I start to ask questions about why they’re afraid, I usually discover that it’s because they’re afraid of what they don’t know. So, we learn! We start talking about why mummification was an important practice in ancient Egypt, or we learn more about the amazing anatomy of a T. rex. I mean who could be afraid of a Tyrannosaurus rex after learning that one of the scientific theories behind their tiny arms is that they used them to show affection and tickle each other? It’s a pretty great mental image. After all, knowledge is power. I’m going to argue that the same concept can be applied to okra, so let’s delve into some food science. Okra is a member of the flowering mallow family along with cotton and hibiscus. The culinary slime-stick we fry up or throw into jambalayas comes from the edible seed pod of the plant. Now, what is the deal with that slime? I’m glad you asked! Okra seed pods contain a substance called mucilage. Sounds tasty, right? Mucilage is made up of polar glycoproteins and exopolysaccharides, or more simply put, it consists of protein chains and sugar residue. Plants use mucilage to store food and water, thicken their membranes, and help with seed germination. 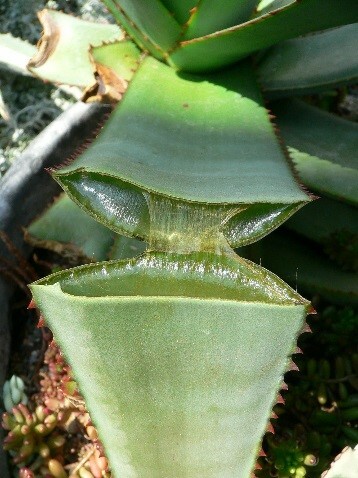 Mucilage is also found in aloe vera and cactus plants. You may have rubbed some mucilage on yourself this summer in an attempt to soothe a painful sunburn. Some carnivorous plants, like sundews, have mucilage glands along their leaves to use as a flypaper trap to capture their prey. Image: The fibrous mucilage found inside the leaves of an aloe plant. 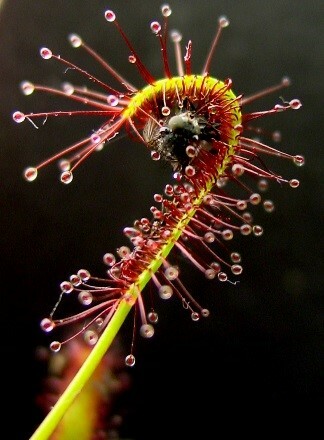 Image: You can see the mucilage at the end of the tentacles as this sundew catches an insect. So, in short, this is the stuff you rub on yourself to heal a sunburn, and the substance some plants use to catch insects. Great, let’s eat it! If you’ve ever told an okraphile that you hate okra, they most likely responded with “You didn’t cook it the right way!” And that may be true. You see, mucilage is hard when dry; however, as you heat mucilage and add moisture, the viscosity of the substance increases which releases the dreaded slime. That’s why many people advocate for quick-frying okra. (For that reason and because anything fried is delicious.) Frying exposes the okra to heat for a minimal amount of time, so the mucilage doesn’t become too viscus. This results in crunchy little okra morsels. Others embrace the goo and use it in gumbos and jambalayas. The mucilage acts as an excellent thickening agent in soups and stews. Because food science. Now that we know a little more about our friend, mucilage, let’s serve up some okra. I’m a converted fan of fried okra. It’s simple, delicious and tends to eliminate the slime factor. I’ve included my favorite recipe below! After you’ve fried up some okra, and you’ve worked up your appetite for okra and science, stop by Okra Charity Saloon during the month of September to support your museum! We’ll be there every Monday, Tuesday, and Wednesday with cocktail chemistry, fossils, crafts, and science. For more information on Okra Charity Saloon and how you can support HMNS, check out Nicole’s blog from September 1st (link to Nicole’s blog here). Cut okra into 1/2 inch pieces. Place okra pieces in buttermilk. Let sit while you combine dry ingredients. Combine flour, cornmeal, garlic powder, paprika, cayenne pepper, salt, and pepper in a large bowl. Stir until ingredients are combined. Remove okra from buttermilk and toss in coating until each piece is completely covered. Remove okra from oil and place on paper towels to remove excess oil. Enjoy, and stop by Okra Charity Saloon to support HMNS! Next Post The Great Sweet Potato Mystery!